Himachal Pradesh Chief Minister Prem Kuamr Dhumal has announced takeover of all those temples which were for the personal interests of few persons would be cancelled. Even after 12 hours since the fire that gutted more than 150 houses in the oldest existing republic of Malana in Kullu Valley broke out, the only way to check its further spread for the inhabitants is to create a gap by breaking the houses which could also be engulfed by the flame. After disappointing lakhs of Christmas and New Year revellers, who could not enjoy White Christmas, the continuous decline in the day temperature has increased the possibility of snow in the next three days. Resentment prevails among residents of this town over the erratic supply of gas by the Hindustan Petroleum for the past two months. Some employees of the agency were even roughed up while distributing gas in view of the acute crisis. The PTA Lecturers and Teachers Union today threatened that in case their appointments were cancelled by the Dhumal regime, they would be forced to commit self-immolation. Over 1,000 helpless depositors of the crisis-ridden Mandi Urban Cooperative Bank continue to be in a financial bankruptcy as the state government’s assurance to revive the bank has yet to see the light of the day. So far, the Reserve Bank of India (RBI) has remained mum on the proposed merger of the bank with the HP State Cooperative Bank. The National Institute of Technology (NIT), Hamirpur, organised its second convocation here today. Former chairman of technical education of India R. Natrajan was the chief guest while justice M.L. Verma was the guest of honour on the occasion. The distillation plant for lavender flowers set up in June last year at Jassaurgarh village situated in Churah valley of Chamba district is proving to be a boon to farmers of this area engaged in the cultivation of medicinal and aromatic plants. Himanchal Pradesh Chief Justice V. K. Gupta today inaugurated an additional accommodation in Judicial complex here in which the second court which was earlier functioning in the old building would start functioning. Breaking a new path in the political atmosphere here in the district, newly elected Congress party MLA of Ghumarwin, Rajesh Dharmani, turned out at Ghumarwin chowk along with his supporters to welcome Chief Minister Prem Kumar Dhumal, who crossed Ghumarwin, while on his way to Hamirpur last evening. 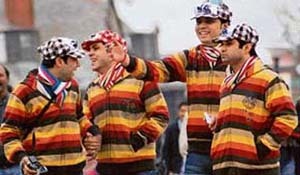 The municipal committee had allotted space in the Dhalpur maidan to some traders and others for the famous Kullu Dussehra that culminated on October 27, 2007. Although the allotment was for only 15 days, over 100 such shops are still functioning there even after more than two months of the culmination of the event. These included ‘chaat’ and juice stalls besides some shops selling used clothes. Once again officers of HPSEB have welcomed the new government with a cut of 50 per cent in the power supply of the industrial sector and to all other consumers in the state. The cut has been imposed with ‘immediate effect’. The state government has decided to convene the first session of the newly elected 11th Vidhan Sabha at Tapovan here from January 10 to January 14. The new speaker and the deputy speaker will be elected and administered oath during the session. The routine work of the winter session will also be taken up during this period. Joginder Singh, an elected member of the local Block Development Committee (BDC), along with his three companions, were booked for allegedly beating and injuring Rajinder Singh, a resident of Panjara village, under sections 325 and 34 of the IPC on Friday. On the occasion of its 65th anniversary, UCO Bank will open five new branches in the state. Resentment prevails among the residents of Ladoh village, near Panchrukhi, over the government’s apathy. Despite repeated requests for a new transformer for the past two years, it has not been installed by the HPSEB so far. R.S. Thakur, deputy director, horticulture, has urged orchardists and farmers in the district to ensure safety and protection of their mango, litchi, papaya and amla plants from frost as this can affect fruit production. These plants needed protection up to the age of five years. According to him, this can be done by covering these plants with grass or any other material, including gunny bags, in such a way that the east-southern side remains open to air and sunlight. ASHA scheme would be started soon in the state through which 5,000 young girls would be given jobs within 6 months, he further added. With the ancient village of Malana, which has of late shot into international fame for its high quality charas ‘Malana crème’ being located at a distance of five km from road head, there was no way the fire could be controlled. To save the remaining 300 houses from being reduced to ashes, the villagers spent the entire day trying to create a sort of fire line by creating a gap. Located at a distance of 8,000 feet, the icy winds made the situation worse as the fire rapidly spread from one wooden house to another. “With no question of a fire tender, there was not even enough water to prevent the fire as the helpless villagers tried to melt the snow to douse the fire,” said Anil Kant, an eye witness. Even though the exact cause of the fire is still unknown but the officials said that it was most likely that the fire from the ‘chulah’ or the ‘angithi’ spread to the dry fodder stacked in homes for the cattle. With the houses made of wood, the fire spread in no time as there was no way to control it. Even though there was no loss of human life, but property worth several lakhs has been devastated. Even the ancient temple of the Jamblu Devta, the local deity, could not be saved. The locals said that precious gold and silver ornaments and valuable idols, having great value in the international market as antiques also could not be saved. Known to be the oldest republic, it is only recently that the village and its inhabitants had started opening up to the modern world. The villagers used to strictly adhere to their own administration, judiciary and political system and still remain deeply rooted in their ancient culture, tradition and belief. It is only due to the coming up of the Malana-II power project that the village is now at a distance of five km walk from the road head. The village has over 500 houses with a population of over 1,000. With different legends about the origin of the people of Malana, it is believed that they are the descendants of Greek soldiers of Alexander’s army, some of whom took refuge even after the great warrior left India. Western disturbances (WD) have moved over Jammu and Kashmir and neighbouring areas, effecting a decline in the day temperature. The maximum temperature in Shimla today was recorded at 11.4°C, while the minimum was 4.2°C. The maximum temperature yesterday was 12.2°C, while the minimum stood at 3.3°C. The fact that the night temperature is on the rise while the day temperature is decreasing has raised the hopes of snowfall in near future. According to the local Meteorological Office the western disturbances are likely to cause rain or snow at isolated places over the next three days. Although the humidity level was low at 50 per cent for snowfall, this is also likely to go up with the possibility of rain being high. Christmas for the last time. All those associated with the tourism industry are hoping that there is snowfall as there has been a steep decline in the hotel occupancy after New Year. It is only snowfall that can help maintain tourist flow so that the hoteliers can have a good season. Old timers say white Christmas and New Year have become a rarity. “Various factors like global warming, increasing pollution and reduced green covers are the possible reasons behind reduced snowfall,” says one of them. The residents alleged that the gas supply was badly affected and consumers of the HP Gas were not getting gas cylinders despite proper booking with the agency, well in advance. The irate mob once or twice blocked the trucks of the agency and according to the owner of the agency snatched the bill books and other documents from the staff. The residents alleged that due to the blanket ban on the felling of tree imposed by the HP High Court, firewood was not available in the private or government depots so much so even the firewood crisis was experienced for cremating dead bodies. They alleged that the kerosene oil too was not readily available which had led to the dependence on cooking gas, which too was not available. Kangra town had a gas agency which was closed and Anil Gas Agency at Dharamsala was assigned the additional job to distribute the gas in the town. Reetu, owner of the Anil Gas Agency, said she was receiving far lesser quantity of gas than required so it was difficult for her to cope up with the requirement of the town. She said she had adequate infrastructure to distribute the gas regularly but the bulk was not coming to her for distribution from the refilling plants. She said she required 16,000 gas cylinders for Dharamsala and Kangra towns every month, whereas, she was receiving around 10,000 cylinders only. She said the genuine consumers were suffering while people using gas for commercial purposes and for cars were making hay. She said gas pilferage through illegal gas outlets in Kangra town was adding to the crisis as there was no check by the authorities on such pilferages and misuse of gas for commercial purposes. She said there was not even a single commercial gas connection at Dharamsala and Kangra but dabas, hotels and other commercial centres were using cooking gas without any check by the authorities. HP Gas chief regional manager Sunil Malik said there was an internal crisis and gas in bulk was not available. He said he was aware about the acute gas crisis in Kangra town and he would be sending three or four trucks of gas from the Hoshiyarpur plant on Monday to meet out the demand. Reetu said she had closed the office at Kangra and had sought permission from the HP Gas authorities to relieve her from the distributership of gas in the Kangra town in view of the crisis and threats received by her and her staff. Hundreds of PTA teachers from all over the state held at meeting at the Kalibari Hall in the wake of the government stand that the PTA appointments would be reviewed under the new policy. There have been about 15,000 appointments of PTA teachers all over the state. “In case the Dhumal regime discriminates against us simply for the reason that we were appointed during the Congress regime, we will have no other option but to undertake self-immolations,” said Vivek Mehta, president of the PTA Lecturers and Teachers Association. The teachers said they were hopeful that the Dhumal regime would not play with their future as it also affected the studies and career of students. “We are not averse to a new PTA policy, but then it should be made in a manner that all 15,000 old appointees are protected,” said Mehta. The teachers said the government must not forget the fact that the 239 upgraded schools were being run by PTA appointees and removing them would affect the studies of the students. “Our appointments were made by the previous regime on the basis of proper recruitment and promotion rules, so we should not be affected by the new policy,” he said. The teachers further said if some appointments had been made wrongly, the government could order a probe into those few cases. Everyone should not be made to suffer on this account, they added. “We are confident that the government will not force us to adopt a confrontational attitude or else it will be responsible for any strong action that the union might take,” he warned. Though the registrar, cooperative societies, had appointed a four-member sub-committee to look into the possible revival and merger of the bank with the state cooperative bank, but the sub-committee has yet to take concrete steps to bail the almost liquidated bank out from its financial mess. According to officials sources, former Chief Minister, Virbhadra Singh had taken up the issue with the governor, RBI, when the latter had visited Shimla last year, but nothing concrete has come out on this front so far. The RBI has not taken any step on the merger issues, they added. President of the Mandi citizens council and action committee of the bank, P.C. Bisht, said over a dozen of depositors had died as they faced financial problems. They had deposited lifetime savings in the bank. Now we pin hopes on the new government as the RBI has not taken any steps on the merger issue so far, he added. The bank administration has recovered over Rs 7 crore from the bank defaulters and has initiated criminal cases against some of them to expedite the recovery. The administrator of the bank, Nirmal Sharma, said sub-committee was taking up the responsibility of the revival and merger of the bank, but the RBI was yet to take a decision on the merger. Natrajan said technical education was playing a vital role in the development of society. He said significant achievements had been made with the help of technology in every field, but it was to be ensured that this did not in any way spoil our environment. 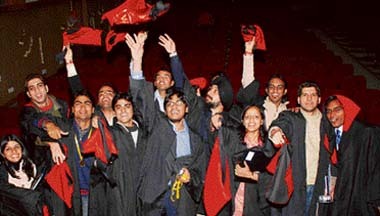 In all, 428 B.Tech and B.Architect students of 2006 and 2007 batches and 26 students of the first batch of the postgraduate course of mechanical, electrical, and civil engineering were awarded degrees. NIT director I.K. Bhat also addressed the gathering. The plant was set up with an outlay of Rs 9.50 lakh by the Yog Manav Vikas Trust, Pukhri District Chamba, in collaboration with the Institute of Himalayan Bio-Resources Technology (IHBT), Palampur, in June this year. The trust has been rendering yeoman service to the people of this region for the past about seven years. The plant is the first of its kind in this region as the fertile picturesque Churah valley is the best-suited for lavender cultivation and a day is not far away when the Churah valley would gain popularity by the name of ‘lavender valley’. The saplings of lavender are being planted in the area ranging at an altitude of 5,000 to 8,000 feet. There is a great demand for lavender oil in the perfume industry at the national and international levels. Yog Manav Vikas Trust chairperson Kiran Dodeja has appealed to the farmers to embark on the cultivation of lavender and derive optimal benefit of the distillation plant set up at their doorstep. The construction work of the additional accommodation was completed much ahead of its time frame. A second court started functioning here in December, 2006, but as there was accommodation for only one court so it began functioning in the old building. For the smooth functioning, an additional accommodation was required. So it was planned to add additional accommodation in the existing court complex on the first floor. 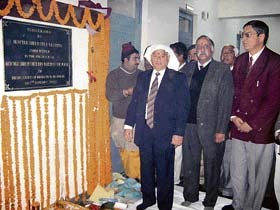 Justice D. D. Sood of Himachal Pradesh High Court performed the pooja on the occasion. The construction work of additional accomodation was started in May, 2007, and the building was to be completed within one year. The Chief Justice performed the ‘pooja’ before the formal inauguration of additional accommodation, Justice Sood session judge, Mandi, A. C. Dogra, additonal sessions judge, Mandi, R.L Azad, presiding officer, fast track court, T. S. Kaistha, CJM, Mandi, K. K. Sharma, additional CJM, Sundernagar, Mandi DC Subashish Panda and other judicial offers of Mandi district, police officers and members of the Bar Association, Sundernagar, were also present on the occasion. Dharmani, accompanied by many Congress leaders of Ghumarwin, including Ghumarwin Nagar punchayat president Satpal and block Congress committee president Dayaram, waited for the Chief Minister on the roadside along with a large number of BJP supporters and presented a bouquet of flowers and congratulated Dhumal as soon as he arrived on the scene. Later Dharmani said Dhumal was now the Chief Minister and he had no reason as to why he should not welcome him whenever he visited his constituency. He said he did not appreciate the approach of some party leaders, who had been avoiding the arrival of the Chief Minister and ministers. He said now it was his duty to attend such functions and welcome the guests and also put before them the problems of his constituency and try and solve them through their help. He said even during the election, he had a personal code of conduct to which he scrupulously stuck and did not break even in the face of grave provocations from his opponents. He said he did not hurl any allegations and did not find any fault against his opponents and their parties. He centred all his activities and speeches and publicity on the Congress programmes. He said t he thought that the people certainly approved of his approach and that was the reason as to why they blessed him with this victory. Garbage and leftover foodstuff have become a nuisance in the area but the municipal authorities have taken no note of it. There has been a rise in the menace of stray cattle in the maidan due to presence of fruit and vegetable stalls there. There are more than 300 points in the ground where local deities have their camp temples during the festival, but the sanctity of these points is being spoiled due to the unauthorised use of the ground by the vendors. In a press note issued here today by Nirmal Attri, senior executive engineer of the HPSEB, Nahan, it was stated that following the directions from the State Load Dispatch Centre (SLDC), Shimla, the board had decided to impose 50 per cent power cut on the industrial sector and all category of other consumers due to acute shortage of power. The note said the common consumers would have to face three to four hours power cut daily. But it did not give details as to what would happen to water supply of Nahan and other towns which were fully dependent on the power supply for pumping the water. Senior officers of HPSEB were not attending to their mobile phones when they were contacted. High-level sources in the ruling party said the load managements was the primary duty of the HPSEB officials and if they were not performing their duty with utmost responsibilities that would be viewed seriously by the new government. They said it was unfortunate that the HPSEB was announcing the imposition of power cut in the state which could have been managed by the board well in time, they said. The sources said Chief Minister P.K. 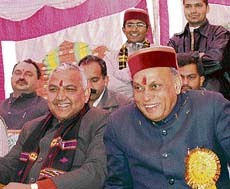 Dhumal was making serious efforts to manage this temporary crisis. Chief Minister had contacted Chief Ministers of Gujarat and Chhattisgarh for getting required power supplied through the authorised and designated power transmission agency so that the same could be added to the power grid to meet any power deficiency in any part of the state during the winter season. The state government has decided to convene the first session of the newly elected 11th Vidhan Sabha at Tapovan here from January 10 to January 14.
elected and administered oath during the session. The routine work of the winter session will also be taken up during this period. A state government’s communiqué regarding convening of the four-day session here had been received in the office of the District Magistrate. After receiving the orders, DM Ashwani Kapoor inspected the Vidhan Sabha complex last evening. Final touches are being given to the new building. This was for the first time in the history of the hill state that the oath-taking ceremony of legislators would take place outside the state capital. Earlier, there were speculations among political and bureaucratic circles that the oath-taking ceremony of the ministers would also be held at Dharamsala, but the Chief Minister later on himself clarified it by saying that the state capital was the appropriate place for the oath-taking ceremony of the ministers. The session of the newly elected Vidhan Sabha was being convened a day after the formation of the council of ministers. The CM had fixed January 9 as the date of the formation of the ministry, the oath-taking ceremony of which would take place at Shimla. According to the police, the victim has been medically examined and there was a grievous injury in his left ear. According to the complaint, the victim was thrashed when he objected the BDC member for carrying sand of the PWD at Panjara village on Thursday, which infuriated the accused, who along with Swaran Singh, Satpal and Bahadur thrashed the complainant. He was rescued by other villagers. The police is investigating the case and no arrest has been made so far. The general manager, UCO Bank, and convener, HP State-Level Banker’s Committee, Ripan Murgai, said 65 new branches will be opened all over the country on the occasion of the bank’s anniversary, tomorrow. He said the five new branches will be opened at Nalagarh, Shimla, Arki, Baba Balaka Nath, Deod Sidh and at Bilaspur. Satish Sharma, a resident of the village, said that low voltage had made villagers particularly students suffer but the authorities remained mute spectator to the problem. He said neither the tube lights nor the TVs were functioning due to low voltage in the village. Sharma said that at one stage executive engineer, HPSEB, Baijnath, on March 23, 2007, had ordered for the installation of the new transformer but the department failed to implement the directions.